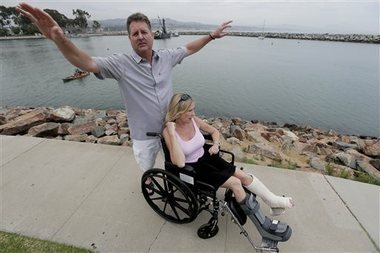 (AP) A dolphin leaped onto a boat in Southern California, crashing into a woman and breaking both her ankles. Chrissie Frickman was boating with her husband and two children June 21 when a pod of dolphins swam alongside them. 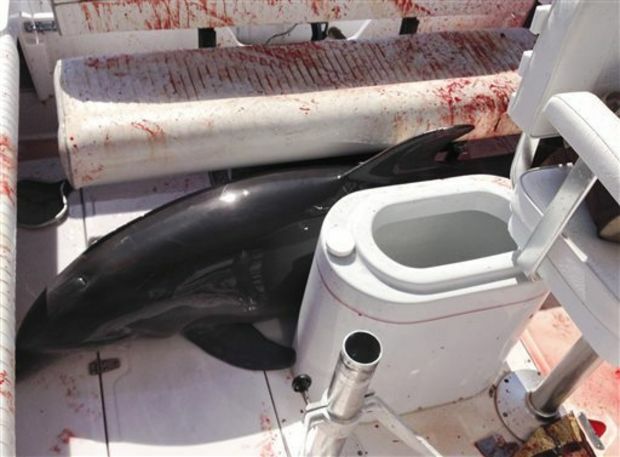 One of the animals jumped on the vessel, knocking Frickman over and landing on her legs. Frickman pulled his wife free and called authorities as he headed toward an Orange County harbor. While he steered, he splashed water on the 350-pound dolphin to keep it alive. “I could hear my phone buzzing and beeping on the floor – it was covered in blood,” he told the Orange County Register. At the harbor, Frickman removed all the seats from the boat and got help pulling the dolphin onto the dock with a rope. His wife is still recovering from her injuries.